After hearing from a group of youth in his ward who are frustrated with the Diversey bus, Alderman Villegas (36th ward) says he’ll work with city agencies to speed up bus service. 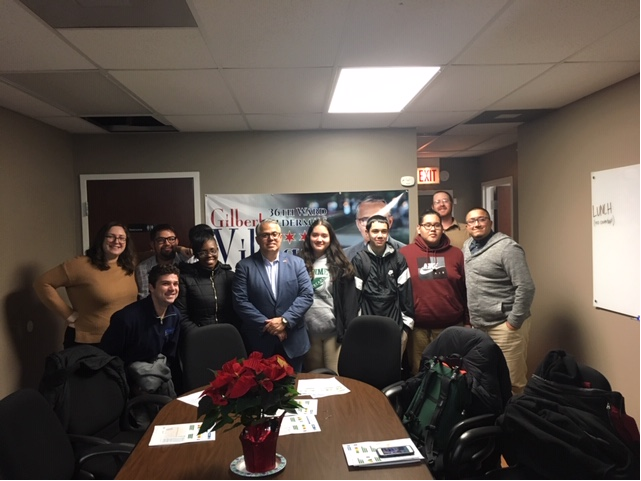 Active Trans partnered with a group of youth advocates from the Northwest Side Housing Center on a meeting with Alderman Villegas in late 2018. The alderman heard stories from the youth of what slow and unreliable bus service has cost them, such as being late to school and doctor’s appointments. As part of the partnership, the Northwest Side Housing Center received a mini-grant from Active Trans to fight for better bus service in their local community. The group used Active Trans’ Bus Friendly Street Report Cards to back up their stories with ward-specific data. The 76 Diversey route received an F, and other routes throughout the 36th Ward got Cs. The youth talked about how frustrating it is to be on a packed bus that’s stuck in traffic behind cars carrying one or two people. They also said there are not enough bus shelters in the ward, which made it less pleasant to wait on a late bus. The 36th Ward participates in Participatory Budgeting, and the youth wondered if those funds could be used towards bus priority projects in the ward. The alderman committed to working with the Chicago Transit Authority and the Chicago Department of Transportation to see what would be done to leverage existing funds to improve the speed and reliability of buses in the ward. The Northwest Side Housing Center has also received funding from the Chicago Metropolitan Agency for Planning’s Local Technical Assistance (LTA) program for a study called Avenues for Growth. If you are a community member of the larger Belmont Cragin area, come out to a public meeting on Tuesday, February 5 to provide your input on how to invest in the important corridors of Diversey, Fullerton and Grand Avenues.